The SP-4 is a very specialized round, developed for the needs of the KGB and Spetsnaz elements of the Soviet armed forces. The key niche of this ammunition is noiseless and flash-less firing during various special operations. The only weapons that use this cartridge are the PSS self-loading pistol and the NRS-2 scout knife with a single-shot weapon built into the handle. Both weapons are of Soviet origin. This cartridge uses a bottlenecked rimless case with a very short neck. The cylindrical bullet is made from mild steel, with a brass driving band at the front. 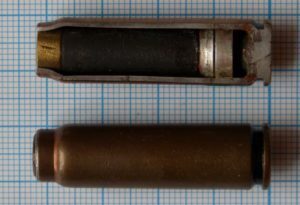 The bullet is seated in the cartridge flush with the mouth, and its base rests on the piston, which separates the bullet from the small load of special propellant. When the cartridge is fired, the propellant gas pushes the piston forward violently, driving the bullet forward and out of the case; the piston is then jammed tightly at the neck of the case, locking the powder gases inside. Immediately after shooting, the fired cases are under strong pressure from inside, and thus are unsafe; in time, the gases inside the case cool down and thus pressure decreases. However, Soviet manuals require special handling of fired cases of SP-4 ammunition. Another interesting fact about this ammunition is that these cartridges are void of any headstamps, for obvious reasons. The 7N36 variant was designed during early 2000s; it is similar to SP-4 but uses brass case and bullet of slightly different design.